The aim of this enquiry is to get students to engage with original documents relating to a suffragette protest. 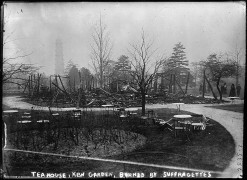 Students will look at records from the prison case files of two suffragettes involved in the burning down of the tea pavilion at Kew Gardens. By interpreting these documents they can discover how the authorities regarded their actions, how the suffragettes were treated, how the women responded to their imprisonment, and how the press reported the event. Show the students the photograph as a starter – you may want to crop off/or conceal the caption if you are displaying on whiteboard. Ask the pupils what they can find out from the photograph and reveal the caption. 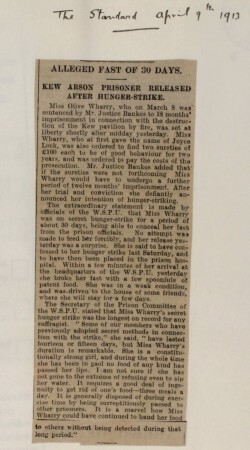 Study the article from the Times for 8 March 1913 which gives an account of events. Break the class in groups and get them to look at different two documents from the online collection. The students then feedback on their documents and/or annotate them at the white board. To support them in this, some general guidance questions on how to evaluate and understand documents are included here, so students can draw their own conclusions and inferences about these events. (Teachers may wish to print these out, and discuss them with the students before they look at the documents). What is the document saying? What names appear in the document? Does it link to other documents in the group? Instead of introducing the suffragette protest as outlined above, some teachers may want the students to uncover it for themselves. Therefore, students start by looking at all of the documents either online or as print outs in small groups, pairs or individually and then carry out the task of writing of the history of the protest at Kew for a school history text book. However it is important that the students are still supported in how to get the most out of the documents, so they should have access to the guidance questions. Having analysed the sources and produced their own version for the school textbook, students can compare and discuss their interpretations. Are they different or the same? Again this could generate discussion about the nature of evidence and how it can be used to construct different interpretations of the past. If possible, students could also look at how the suffragette movement has been analysed and described in other published history textbooks or research other documents used for studying the topic. We hope that by presenting teachers with a collection of documents it offers them the flexibility to develop their own approaches and questions and differentiate the task as they see fit. Teachers may for example prefer to break down this task and ask the pupils to explore the story of one of the suffragettes involved in events at Kew Gardens, i.e. Olive Wharry or Lilian Lenton. 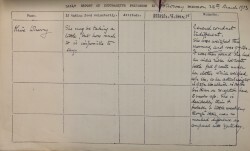 Others may wish to extend their work on the suffragettes to create an enquiry question of their own by using the other resource on the website: a collection of themed documents on police methods for their capture, suffragette tactics, and the government response to the women involved. 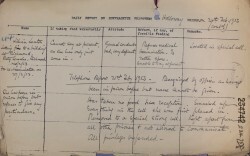 Please note that the resources are mutually exclusive, and both resources contain different documents relating to the same women, Olive Wharry and Lilian Lenton. Finally, the links provided on this webpage also provide access to yet more document and sound files on the suffragettes. All documents are provided with transcripts. Photographs from the Library of Congress and a private collection. The development of political power from the Middle Ages to the 20th century, including changes in the relationship between rulers and ruled over time, the changing relationship between the crown and parliament, and the development of democracy. OCR History B Unit A972: British Depth Study: How was British society changed, 1890-1918? Here is a group of documents that relate to a particular suffragette protest at Kew Gardens in 1913. Write the history of the protest at Kew for a chapter on the suffragette movement for a school history text book. 1. Produce a timeline of events by listing the date of each document and summing up the key events described in the document. 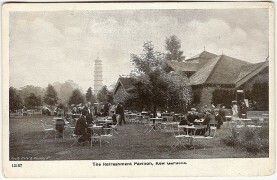 What was the suffragette protest at Kew Gardens in 1913? 3. Write up your history of the Kew protest based on your interpretation of all of the documents in this collection. Today, every British citizen from the age of 18 has the right to vote and so have a say in their government. This right was not easily achieved. In the 19th century, campaigners fought to extend the vote to working class men in 1867 and 1884. However, there was still much opposition to women getting the vote at the time. Without the vote it meant that Victorian women had very few rights and it represented their inequality with men in the law. For example until 1882 a woman’s property often went to her husband on their marriage. Various organisations joined to form the National Union of Women’s Suffrage Societies led by Millicent Fawcett in 1897 to campaign for the vote for women. Their methods included petitions, demonstrations and public meetings. The Women’s Social and Political Union, founded by Emmeline Pankhurst and her daughter Christabel in 1903, used more militant tactics. 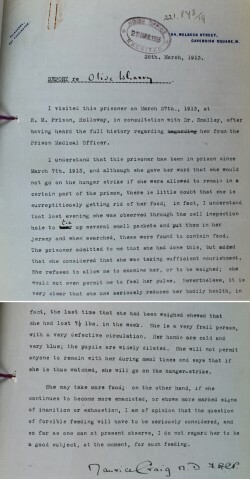 Many suffragettes went to prison as a result of their actions and while in prison they often went on hunger strike to gain publicity for the cause. As a result, they were forcibly fed. In 1913 the Prisoners Temporary Discharge for Ill-Health Act was passed in Parliament, often referred to as the Cat and Mouse Act. According to this, any hunger-striking woman prisoner was released when they became seriously ill, and re-arrested when recovered. It is important to remember that other groups supported votes for women too. For instance, the Women’s Freedom League was formed in 1907 and later set up the Women’s Tax Resistance League in 1910. Their supporters argued that there should be no taxation without representation. They also encouraged women to refuse to register for the 1911 census. Men’s suffrage societies were also part of the general campaign, for example the Men’s League for Women’s Suffrage founded in 1907 and the Men’s Political Union for Women’s Enfranchisement. With the coming of the First World War the NUWSS and WSPU called off the women’s suffrage campaign. Afterwards, in 1918 women were given limited voting rights with the Representation of the People Act. Universal suffrage, that is, the vote for men and women on equal terms, was finally achieved with the Equal Franchise Act in 1928 when all men and women were given the vote at 21 years. In 1969 the voting age for men and women was lowered to 18.